When it comes to beauty, coconut oil is listed as an ingredient in pretty much any DIY recipe promising to make you more radiant and solve your personal problems. Googling “coconut oil DIY” gives you about 2.3 results and there are about 1.15 million videos on YouTube on the topic of “coconut oil beauty.” BuzzFeed has a plethora of articles touting the uses of coconut oil, calling it your best friend, the answer to all your problems, and even a way to fix parts of your life, so it was to my utter shock when I recently stumbled across an article saying that you should actually avoid coconut oil at “all costs” for some things. “Comedogenic,” the medium-sized scary word that I’m never able to spell, is all over skincare products that claim to be not that. Its meaning comes from the word “comedo,” which is the least severe form of acne and is caused by clogged pores, and products that are listed as highly comedogenic have a “tendency of the ingredients to clog pores, which may cause acne.” Our frenemy coconut oil is ranked 4 out of 5 on this list, meaning its tendency to sabotage your skin is “fairly high,” so you might want to avoid putting it on your face and leaving it there. Because coconut oil can penetrate your hair follicle, it can prevent water being absorbed — which can leave you with dehydrated strands that are literally full of oil. If you have super porous hair that has room for water and coconut oil, you might be fine using this as a mask or treatment, but if you don’t, your hair could end up feeling extremely dry and straw-like. Am I the Devil’s Fool? Typically, those with fine to medium shiny hair will see good results from coconut oil and notice stronger, shinier hair with more volume. Those with coarse or dry hair may not struggle with low protein at all and coconut oil may lead to more brittle hair and hair loss. These people may benefit more from other types of oil like marula oil or argan oil. Should We Shun Coconut Oil? While the oil is fairly comedogenic, it doesn’t necessarily mean it’ll break you out – some people are more prone to acne than others, which are the ones who might want to avoid using it as a moisturizer (@me: stay away), but it might work just fine for others. Furthermore, if you invested in a jar of coconut oil and are of the acne-prone subset and don’t want it to go to waste, you can still use it on your face in the form of a makeup remover (particularly around the eyes) – just make sure you wash it off first! This study has firmly established the superiority of the protective effect of coconut oil on hair damage in grooming processes when it is used as a pre-wash conditioner as compared to mineral oil and other vegetable oils such as sunflower oil. It not only has a protective effect on undamaged hair but also on chemically treated hair, UV-treated hair, and hair treated with boiling water (i.e., hair in water at 100øC for 2 hr). The ability of coconut oil to penetrate into hair cuticle and cortex seems to be responsible for this effect. Coated on the fiber surface, it can prevent or reduce the amount of water penetrating into the fiber and reduce the swelling. This, in turn, reduces the lifting of the surface cuticle and prevents it from being chipped away during wet combing. A reduction in the WRI is additional evidence of its efficacy in decreasing water absorption. The data presented in this work clearly show the superiority of coconut oil as a hair damage protectant, in the grooming of untreated or damaged hair. In real people speak, I’m pretty sure this is all just to say that compared to other oils, coconut oil still does a dang good job. Coconut Oil: Hero or Villain? Where have all the good men gone and where are all the gods? All of this begets the question: is coconut oil the enemy here? My best answer is no, not really. Maybe coconut oil isn’t as omnipotent as we had hoped and wanted it to be, but I don’t think it’s completely gone rogue. Sure, it has imperfections, so it might not be a hero either – rather, we could classify it as an antihero with some “dark traits” for different types of people, like Macbeth or Hamlet, who can do nothing more than attempt to operate under the confines of the fate and weight of importance we assign to it. Maybe it didn’t end well for Macbeth or Hamlet, but this doesn’t mean coconut oil is on a dark path to destruction! At the end of the day, it all comes down to you. Moral of the story? Know yourself and treat yourself right. For some people who aren’t acne-prone and who have low levels of natural protein, coconut oil might actually be a God-send as a moisturizer and hair mask. For those who are acne-prone and don’t have a protein issue, you might not want to use it in the same way as the prior group. Coconut oil can still be useful for everybody, but (s)he who wields the sword must know how to use it. HowStuffWorks Health // What Does Non-comedogenic Mean? Wellness Mama // Coconut Oil For Hair: Good or Bad? Food Navigator // Has coconut oil lost its luster? *Disclaimer: I am not affiliated with or compensated by any of the brands mentioned (I wish!). As always, all thoughts & opinions are my own (unless stated otherwise)! The New Consumerism: How is it Affecting the Beauty Community? This was such an interesting read! I tend to use coconut oil to massage my scalp as I read it can help sensitive scalps ! 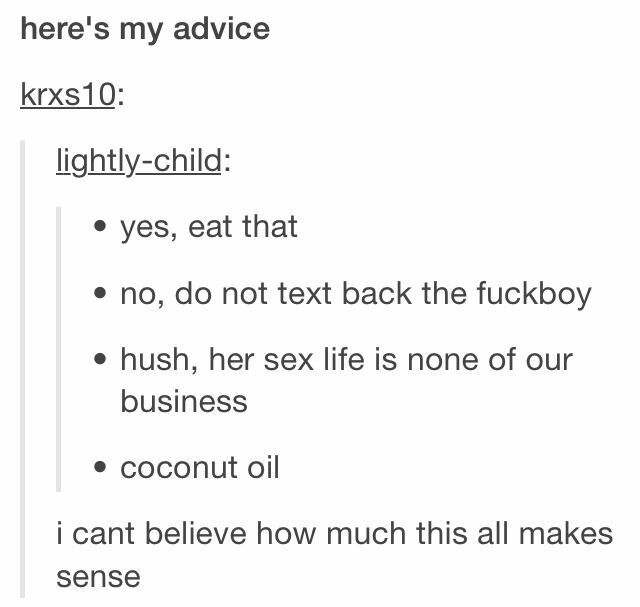 Coconut oil is almost solely responsible for the bad rap oil gets in general. People try it because everyone raves about it, it breaks them out horribly.. or wrecks their hair (which is a protein issue btw and doesn’t really have anything to do with the oil itself) and they swear off oil because it’s evil. All oil is different just like the sources it comes from. So many “absolutes” online and people who read just enough to convince themselves they know everything without actually understanding anything. Do a little research on what you want it to do and it’s characteristics and oil can be your best friend. Also remember you can be allergic to anything.. I’m allergic to argan oil.. nothing wrong with the oil, that’s on me. I don’t use any packaged skincare anymore and my skin is the best it’s ever been… but I avoid coconut oil at all costs because it breaks me out in cystic acne pretty much on contact. I tried oil cleansing with coconut oil once and had a horrifying experience with it – completely broke me out! I’ve had good results with using it in my hair, but I agree that individual research is usually needed since we all react to things differently!